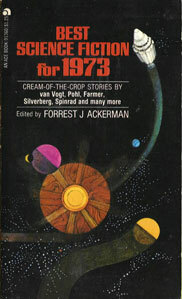 Best Science Fiction for 1973. ed Forrest J. Ackerman. Ace, 1973. Norman Spinrad. A Thing of Beauty. Robert Silverberg. What We Learned from this Morning’s Newspaper. Philip Jose Farmer. Sevent Years of Decpop. Milton A. Rothman. Getting Together. Thomas N. Scortia. By The Time I Get To Phoenix. Robert Bloch. Forever and Amen. A.E. van Vogt. Ersatz Eternal. Frederik Pohl. The Merchants of Venus. Argosy Magazine #2, (May/June 2004).